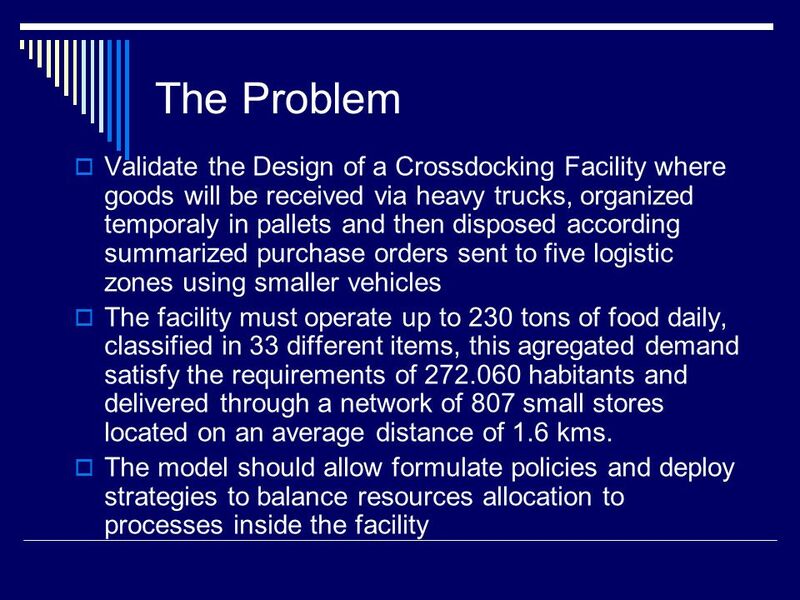 Validation Using Simulation of a New Cross Docking Facility Design Presenters: José Antonio Mesa R. Diego Mesa R. Javier Orjuela C. Universidad Distrital. 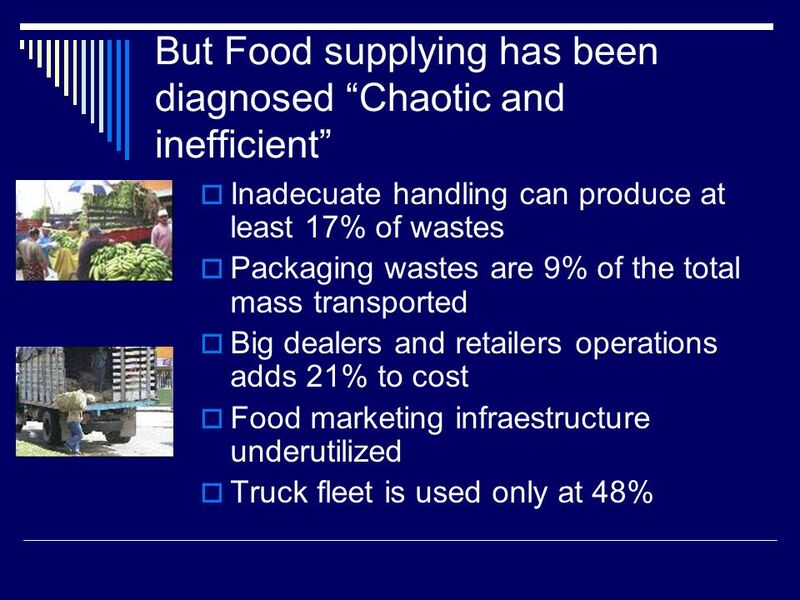 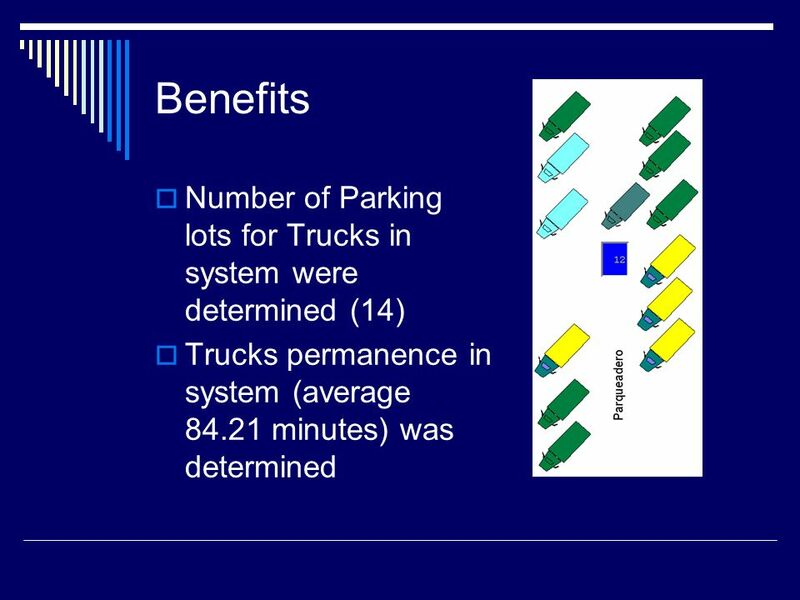 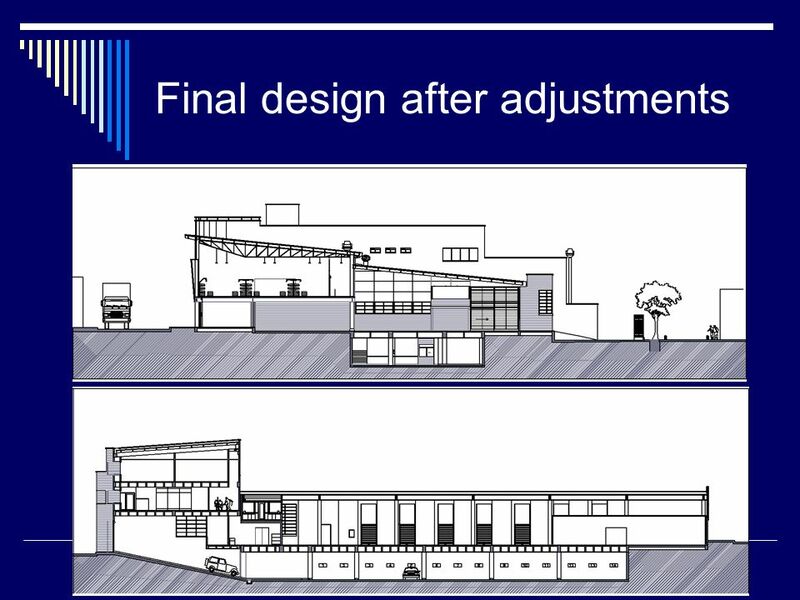 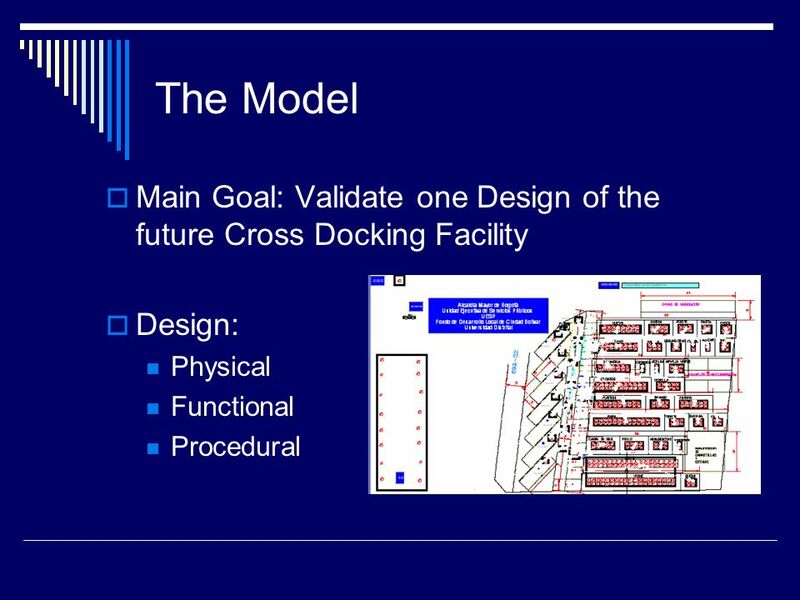 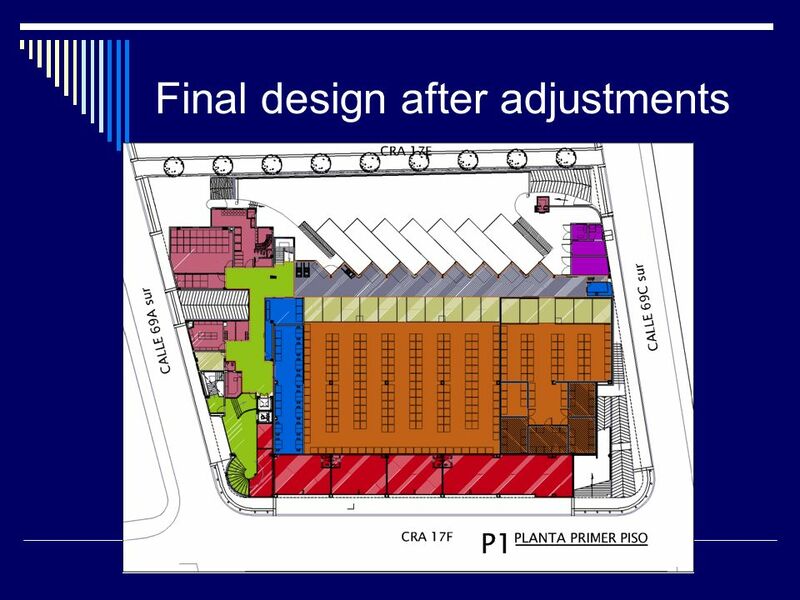 1 Validation Using Simulation of a New Cross Docking Facility Design Presenters: José Antonio Mesa R. Diego Mesa R. Javier Orjuela C. Universidad Distrital Francisco José de Caldas Bogotá, Colombia, South America. 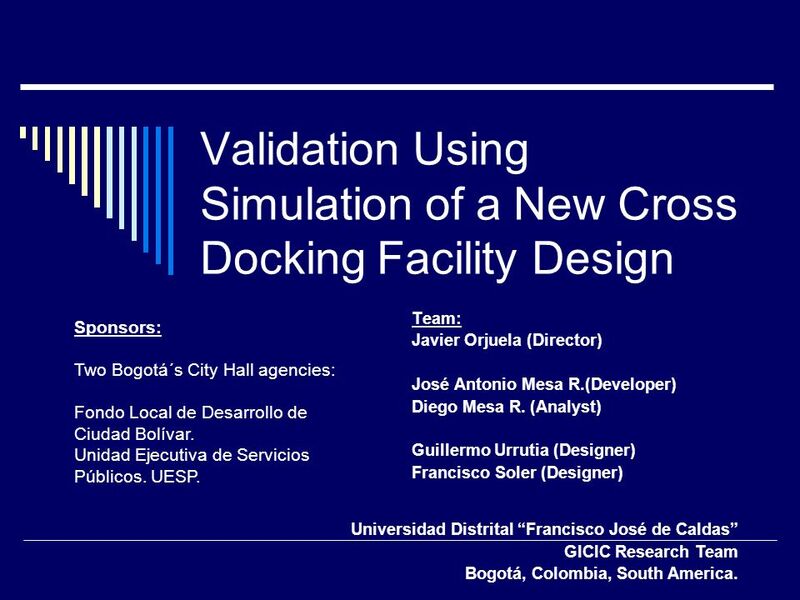 2 Validation Using Simulation of a New Cross Docking Facility Design Team: Javier Orjuela (Director) José Antonio Mesa R.(Developer) Diego Mesa R. (Analyst) Guillermo Urrutia (Designer) Francisco Soler (Designer) Universidad Distrital Francisco José de Caldas GICIC Research Team Bogotá, Colombia, South America. 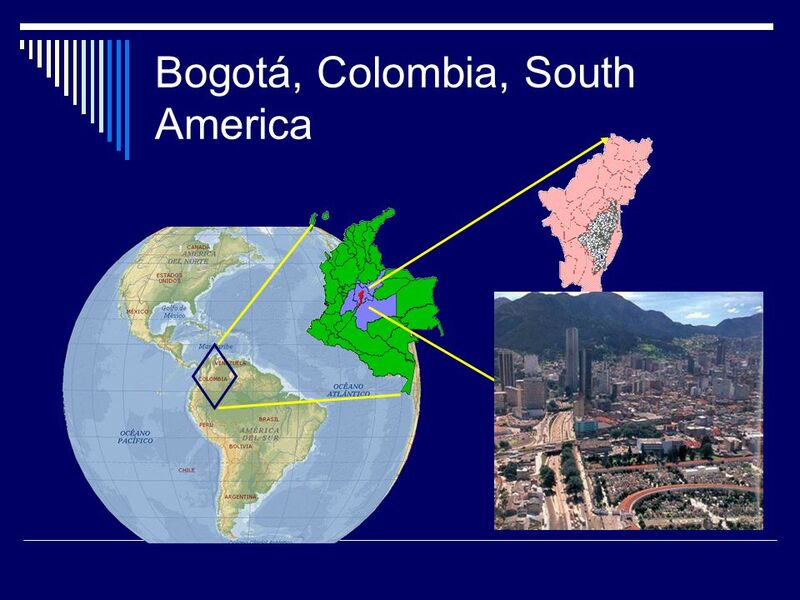 Sponsors: Two Bogotá´s City Hall agencies: Fondo Local de Desarrollo de Ciudad Bolívar. 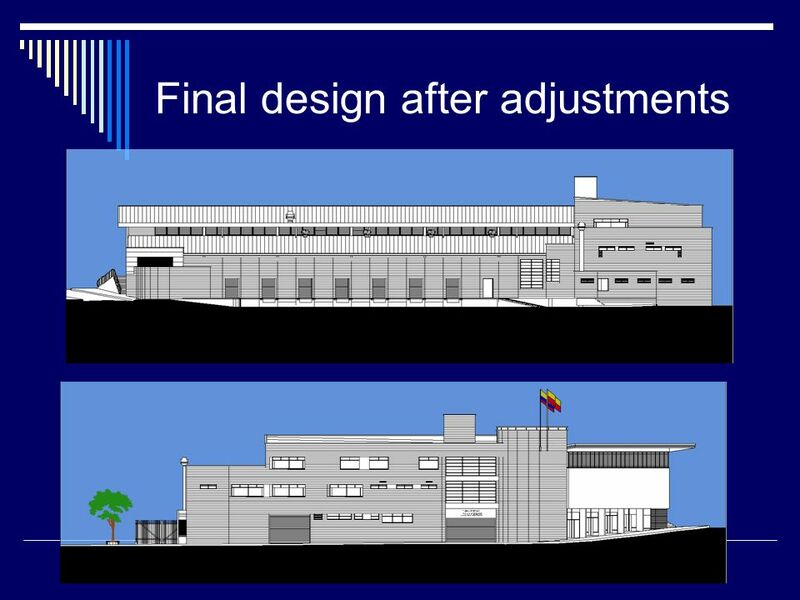 Unidad Ejecutiva de Servicios Públicos. 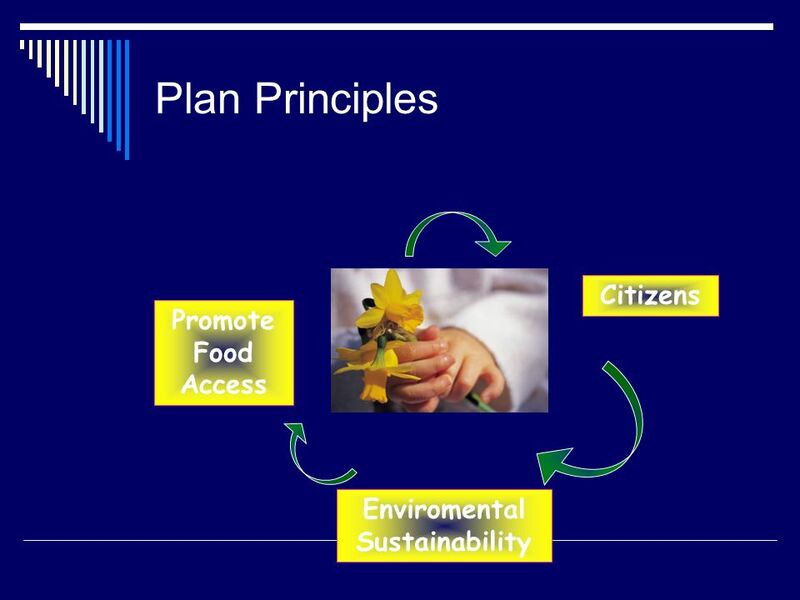 UESP. 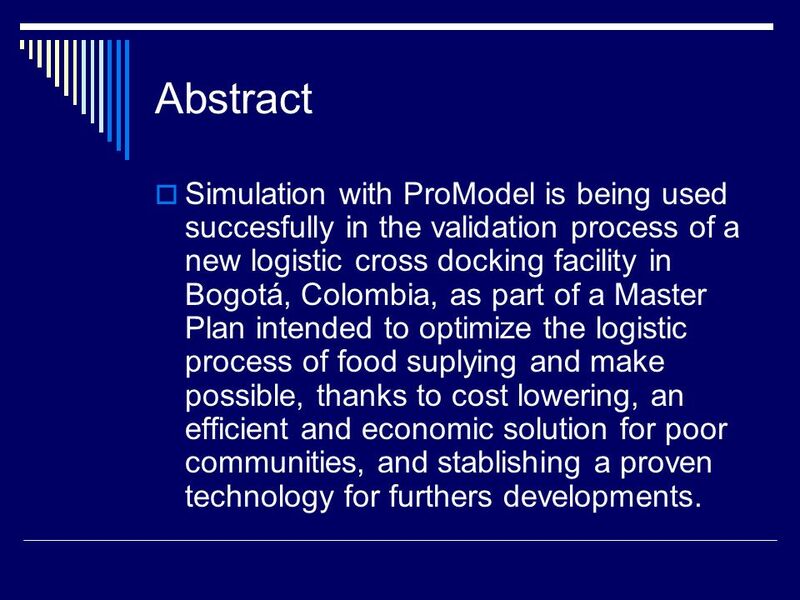 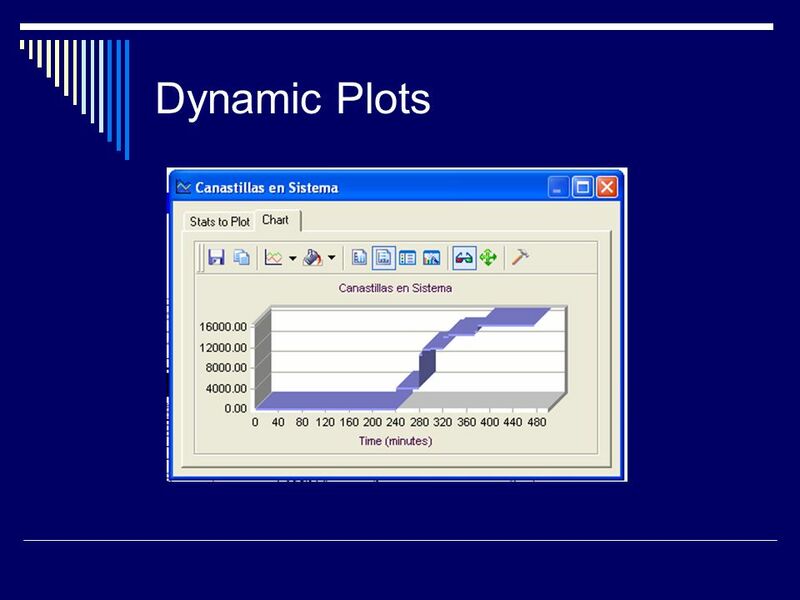 3 Abstract Simulation with ProModel is being used succesfully in the validation process of a new logistic cross docking facility in Bogotá, Colombia, as part of a Master Plan intended to optimize the logistic process of food suplying and make possible, thanks to cost lowering, an efficient and economic solution for poor communities, and stablishing a proven technology for furthers developments. 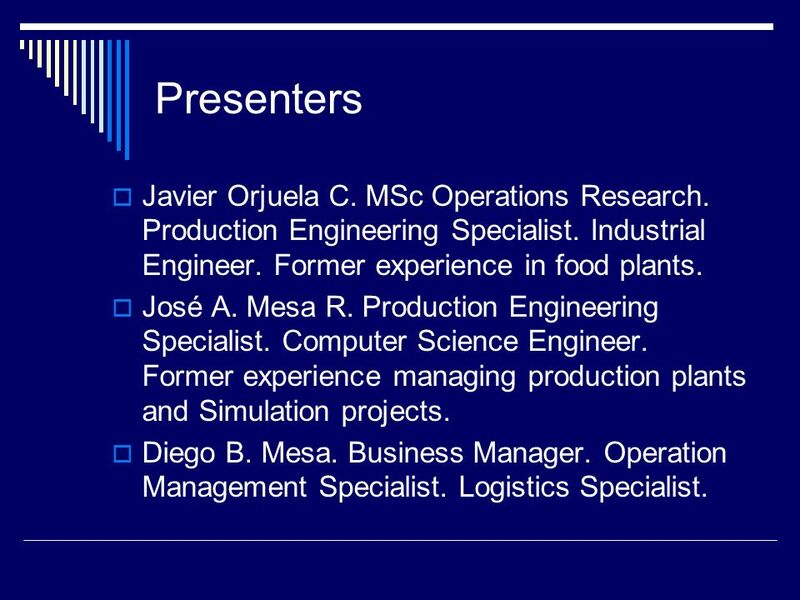 4 Presenters Javier Orjuela C. MSc Operations Research. 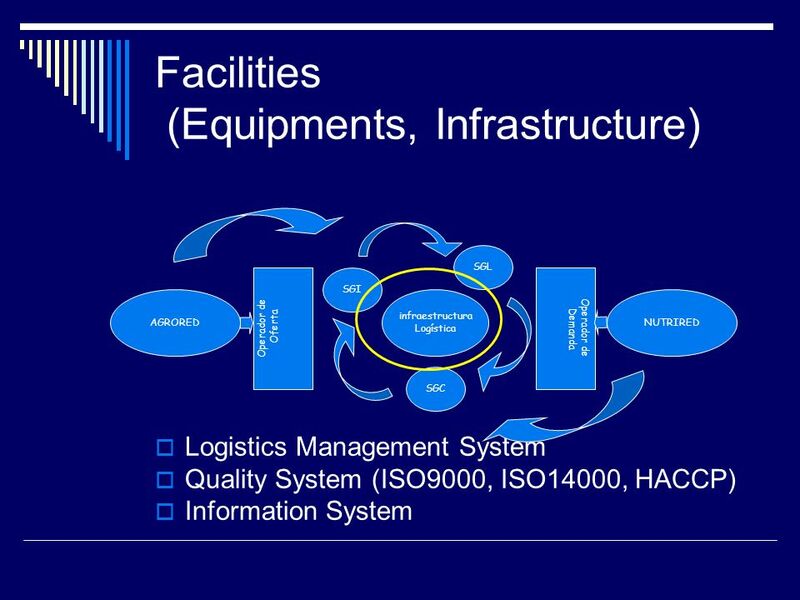 Production Engineering Specialist. 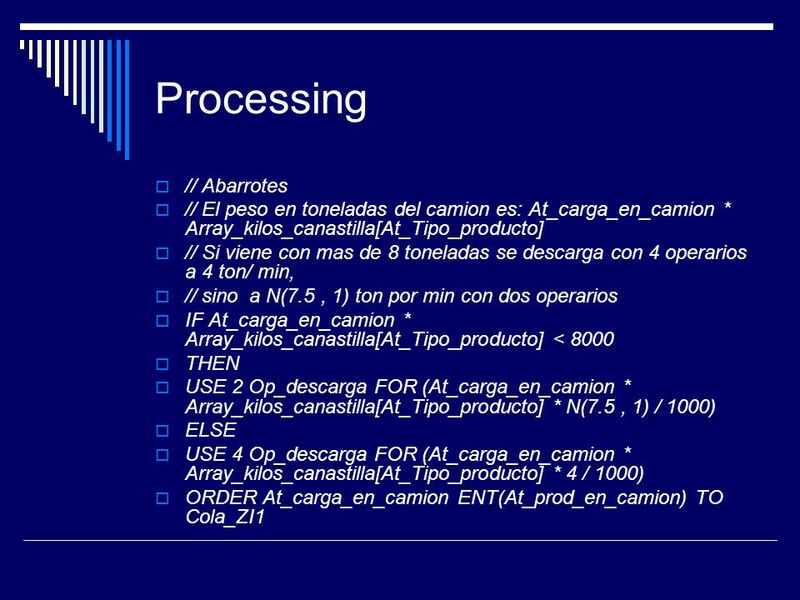 Industrial Engineer. 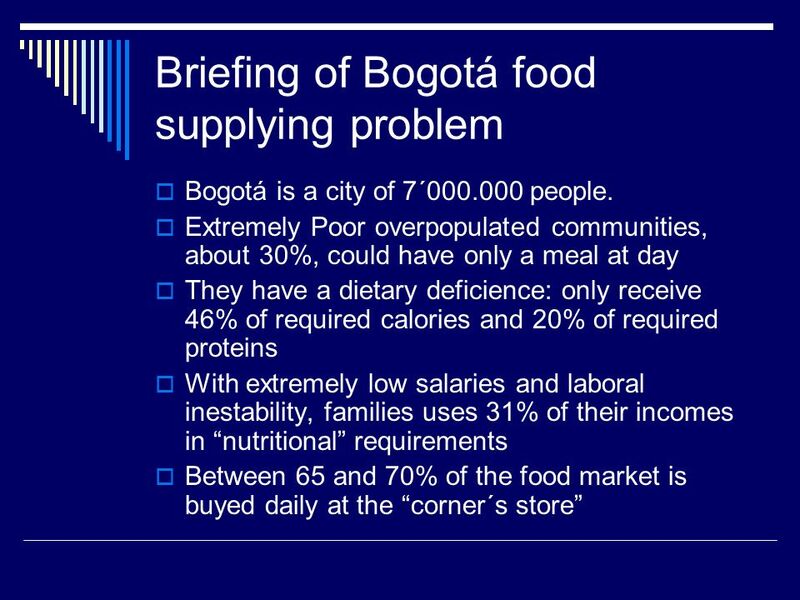 Former experience in food plants. 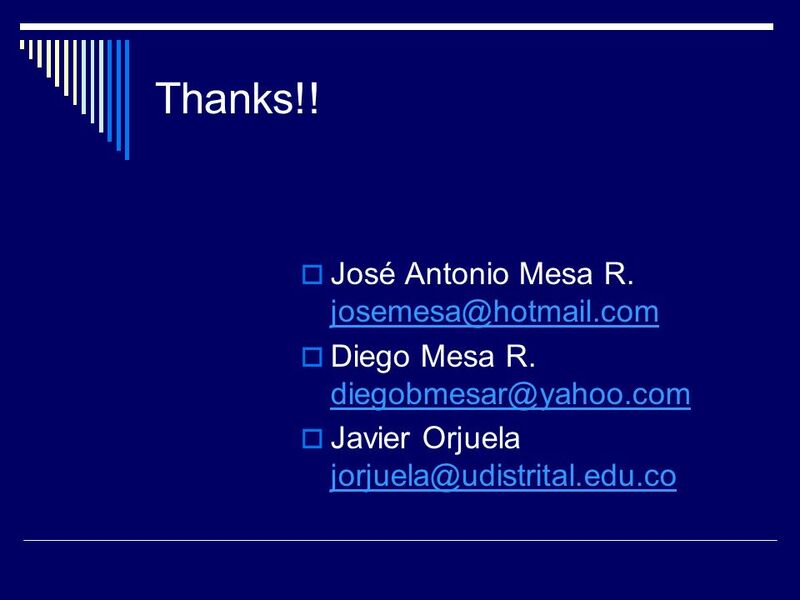 José A. Mesa R. Production Engineering Specialist. 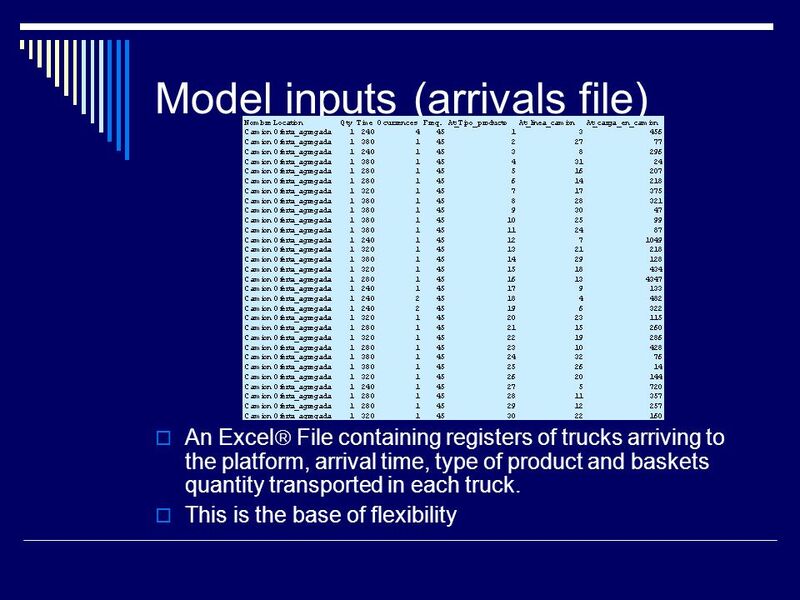 Computer Science Engineer. 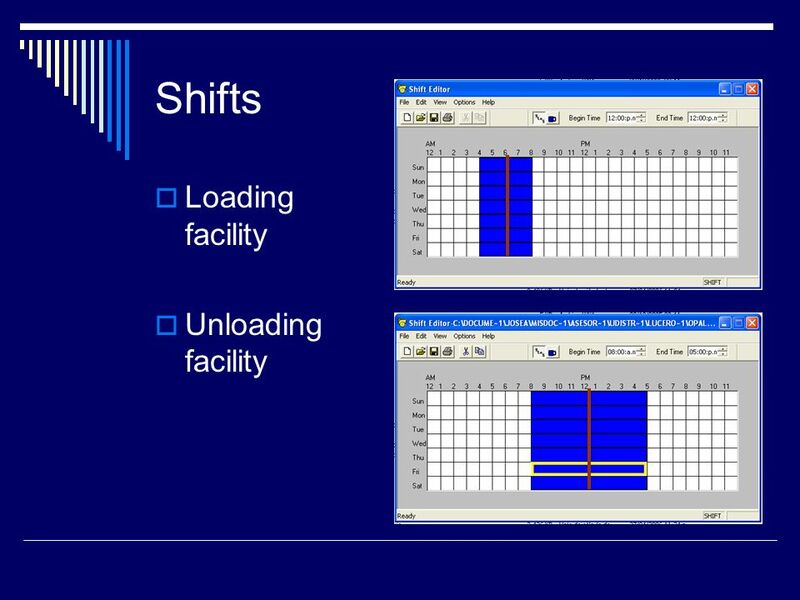 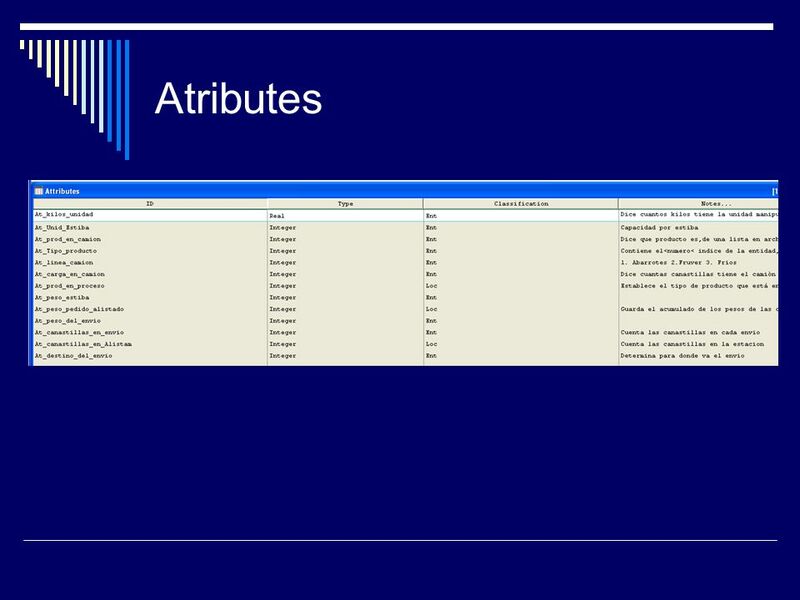 Former experience managing production plants and Simulation projects. 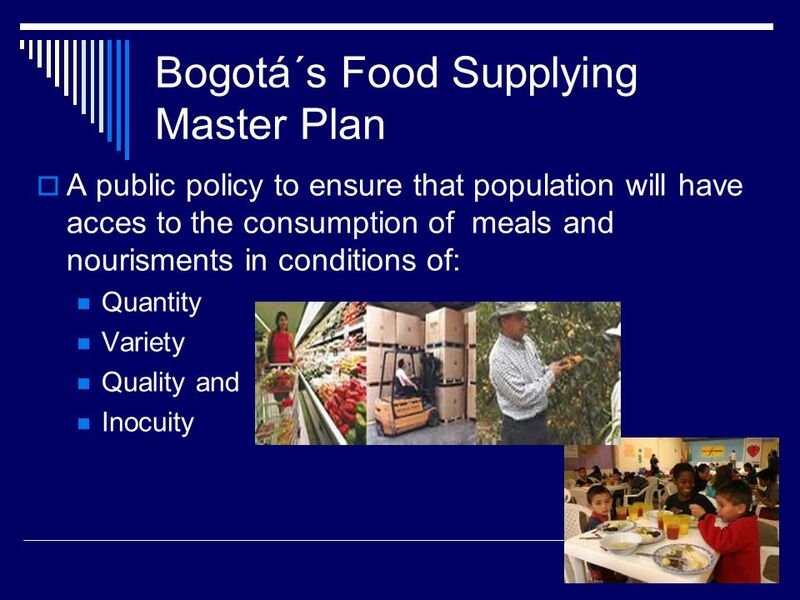 Diego B. Mesa. 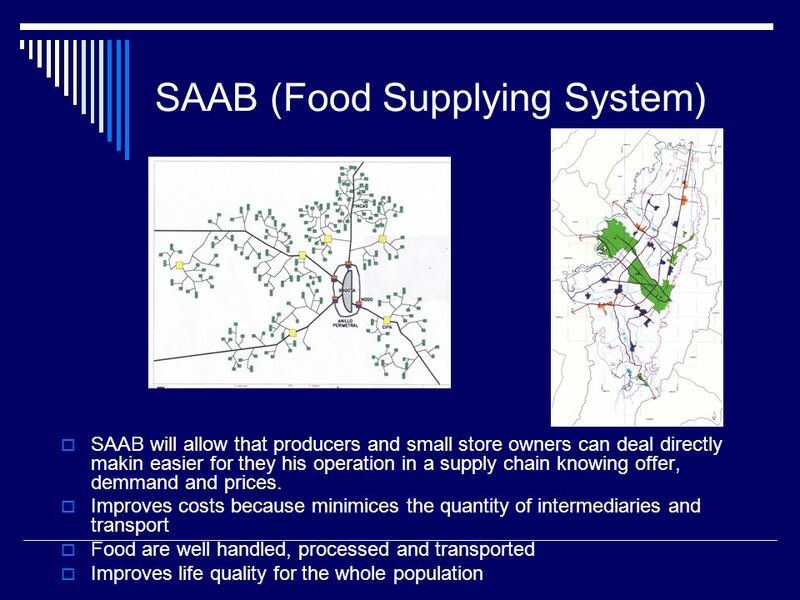 Business Manager. 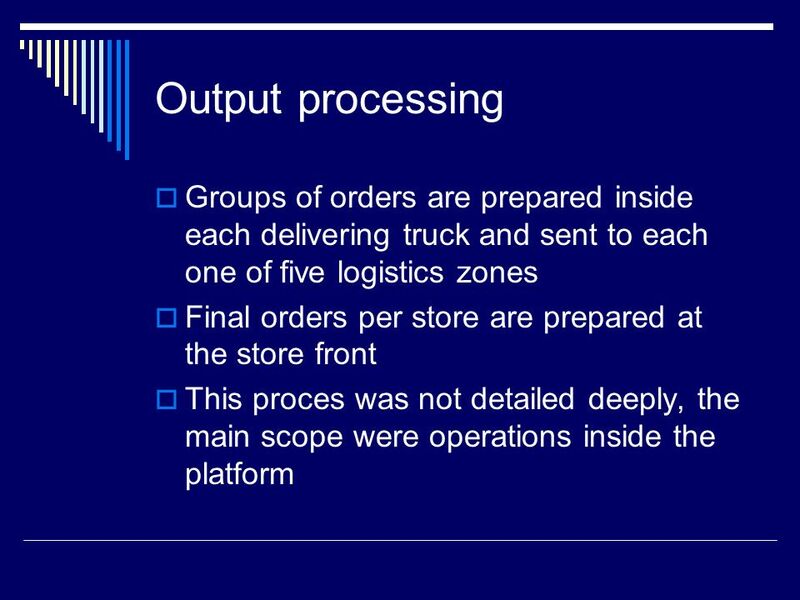 Operation Management Specialist. 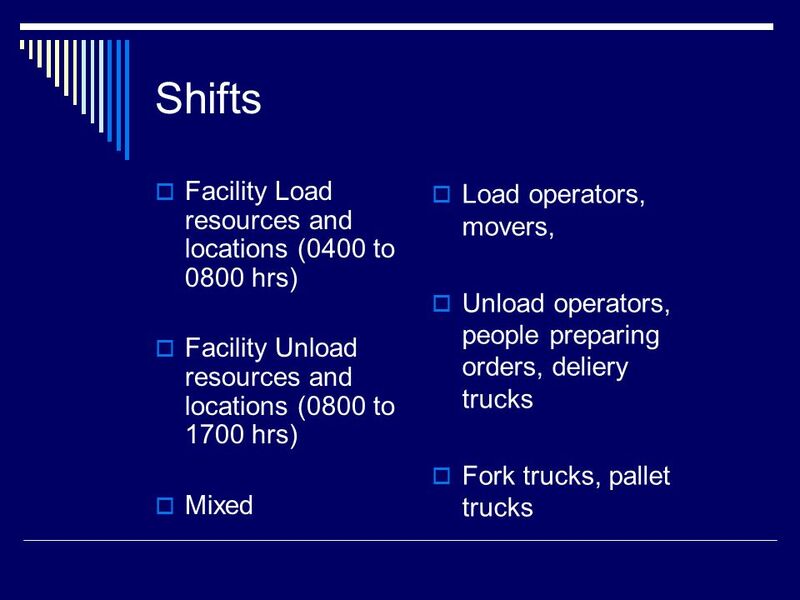 Logistics Specialist. 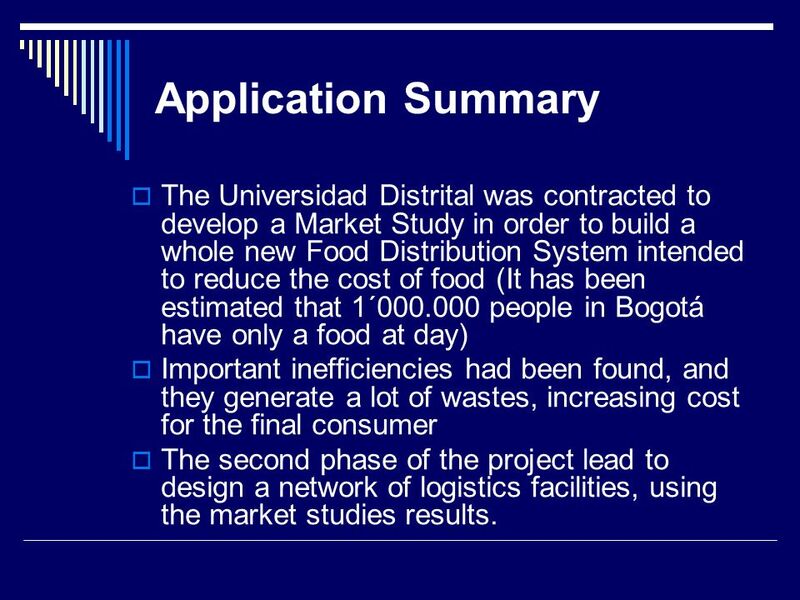 5 Application Summary The Universidad Distrital was contracted to develop a Market Study in order to build a whole new Food Distribution System intended to reduce the cost of food (It has been estimated that 1´000.000 people in Bogotá have only a food at day) Important inefficiencies had been found, and they generate a lot of wastes, increasing cost for the final consumer The second phase of the project lead to design a network of logistics facilities, using the market studies results. 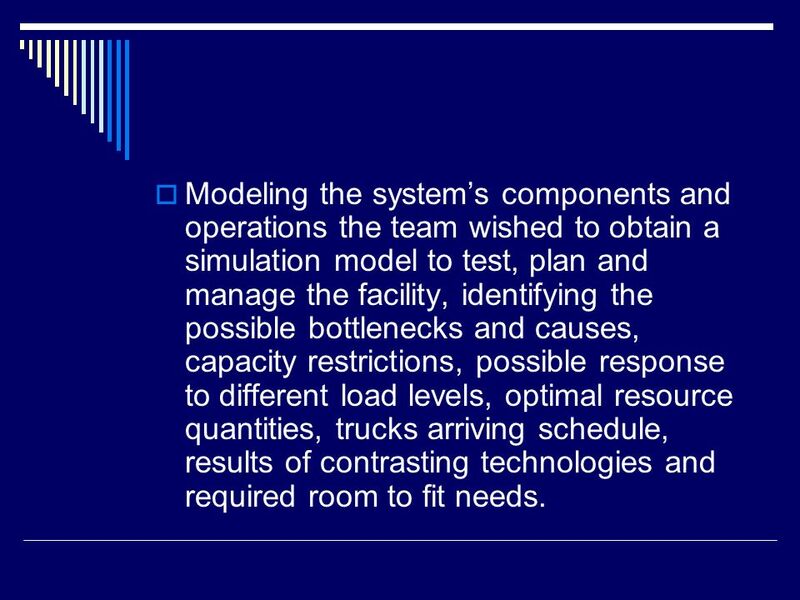 19 Modeling the systems components and operations the team wished to obtain a simulation model to test, plan and manage the facility, identifying the possible bottlenecks and causes, capacity restrictions, possible response to different load levels, optimal resource quantities, trucks arriving schedule, results of contrasting technologies and required room to fit needs. 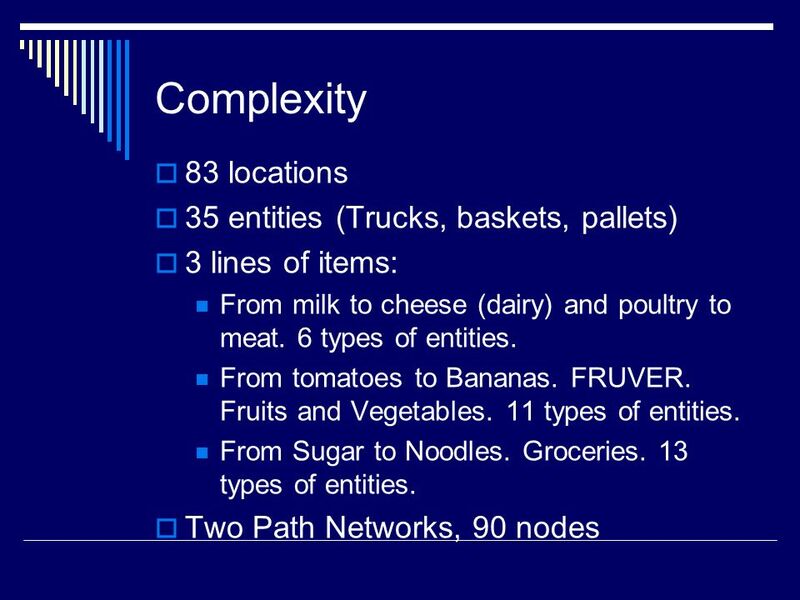 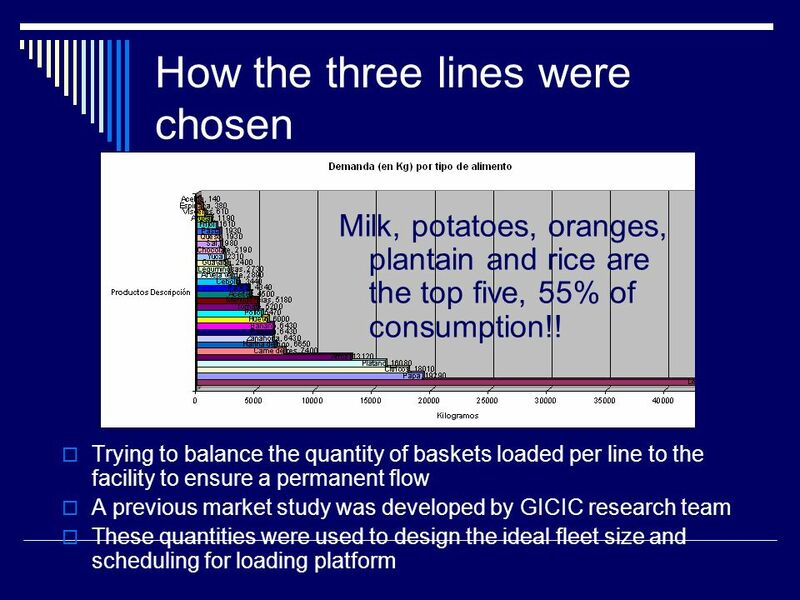 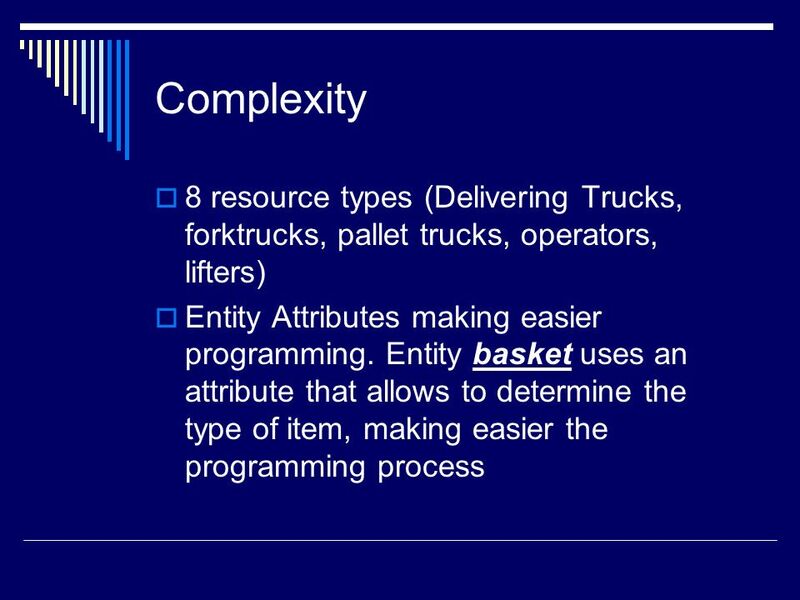 25 How the three lines were chosen Trying to balance the quantity of baskets loaded per line to the facility to ensure a permanent flow A previous market study was developed by GICIC research team These quantities were used to design the ideal fleet size and scheduling for loading platform Milk, potatoes, oranges, plantain and rice are the top five, 55% of consumption!! 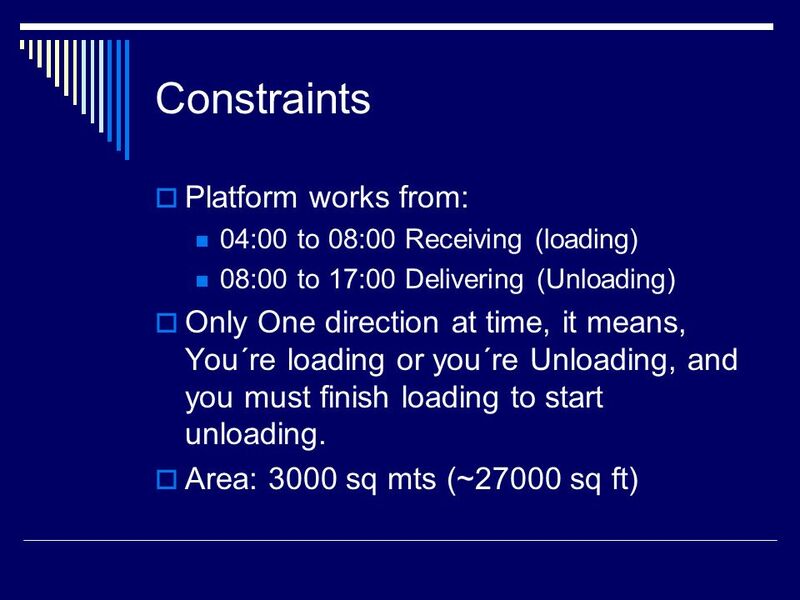 31 After loading is complete… Start preparing purchase orders, send trucks (3 tons) and deliver them to five different logistic zones!!! 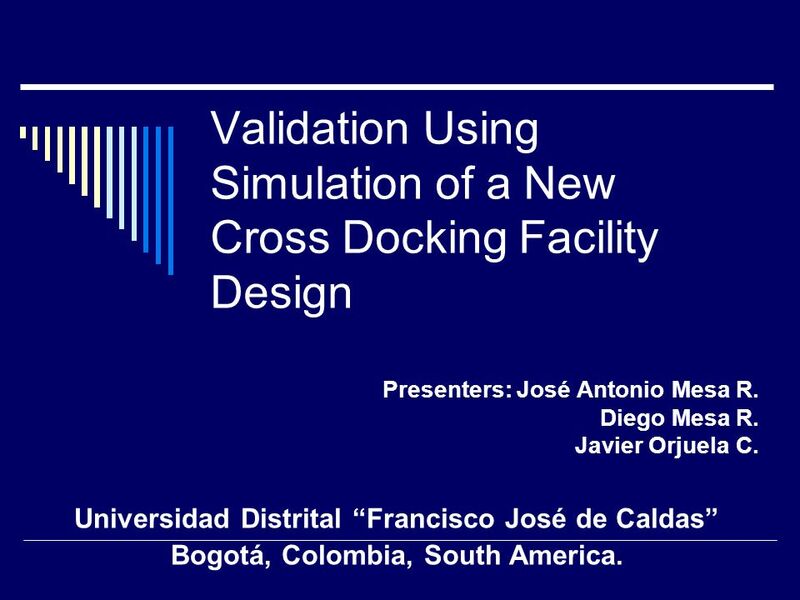 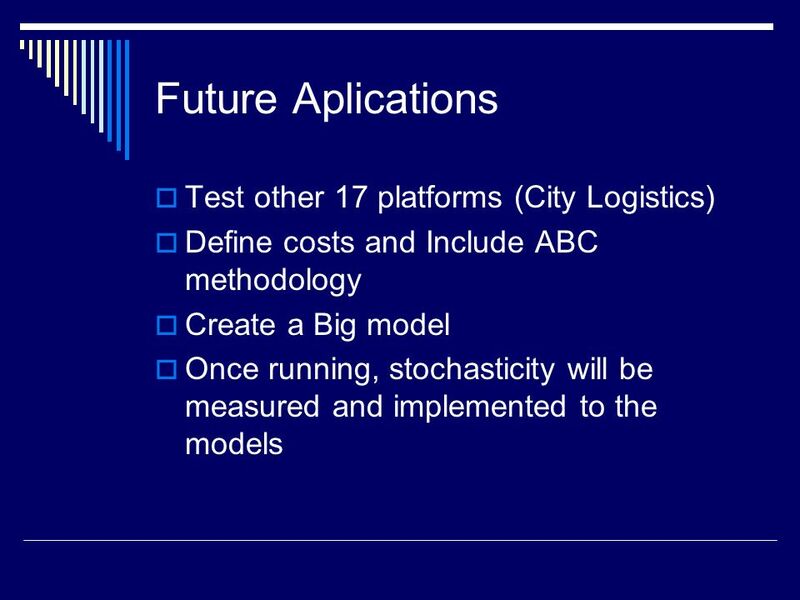 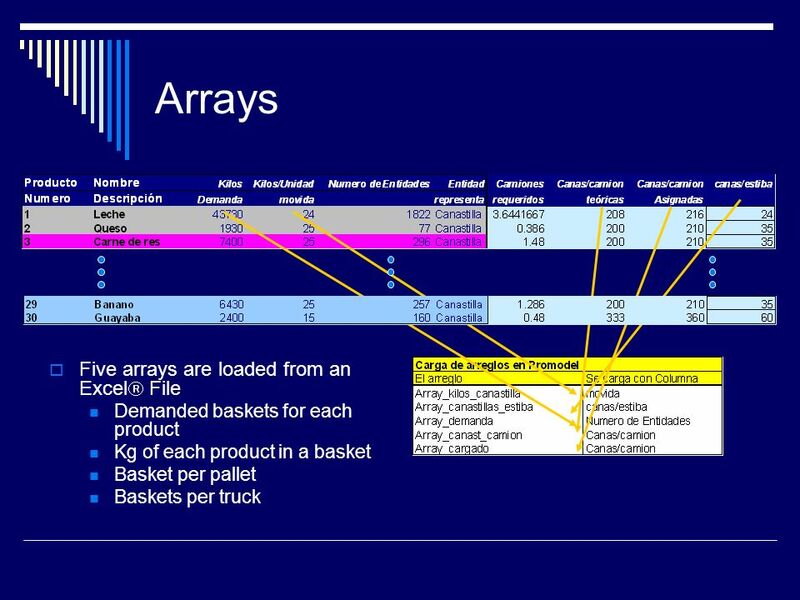 Download ppt "Validation Using Simulation of a New Cross Docking Facility Design Presenters: José Antonio Mesa R. Diego Mesa R. Javier Orjuela C. Universidad Distrital." 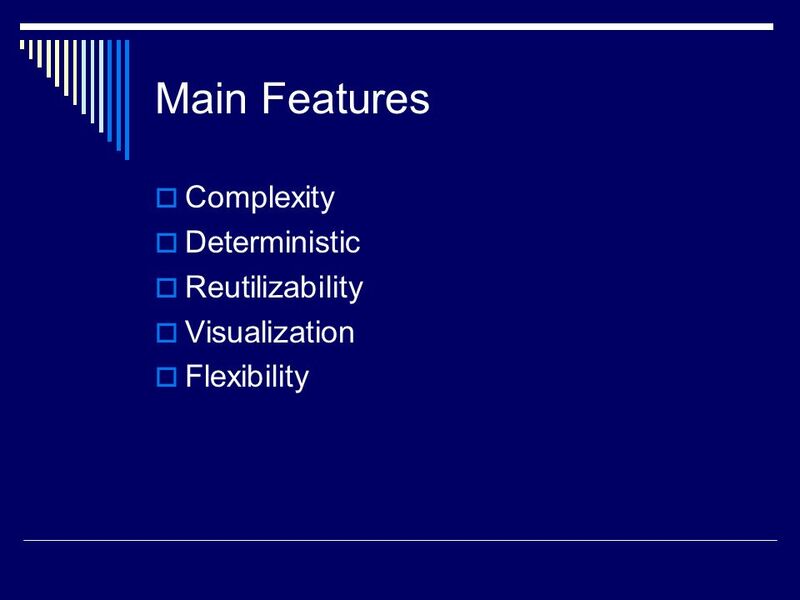 © Tarek Hegazy – 1 Basics of Asset Management Prof. Tarek Hegazy. 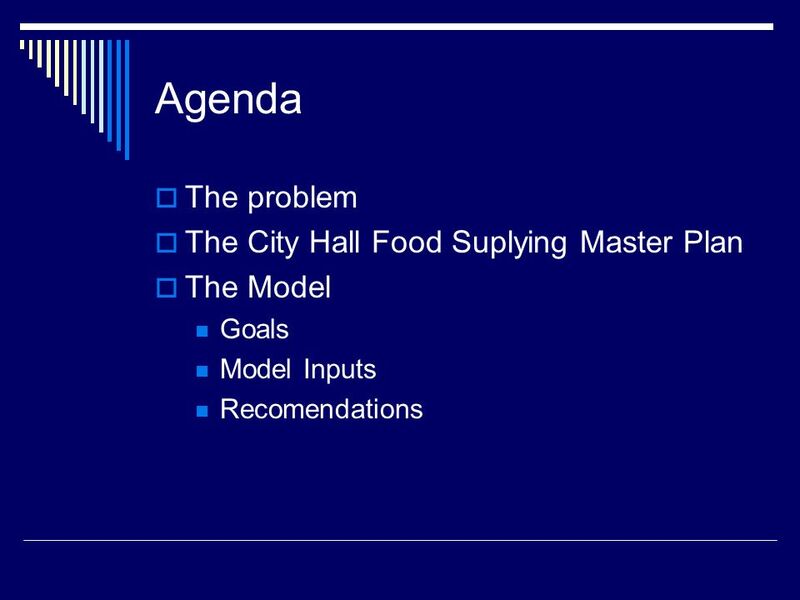 Confidential and Proprietary to Food & Restaurant Solutions Int'l LLC Copyright 2010 CASE STUDIES January 1, 2010 Confidential and Proprietary to Food.